The 3rd WRICOS (the Writing Contest of SUN) is now open for application. 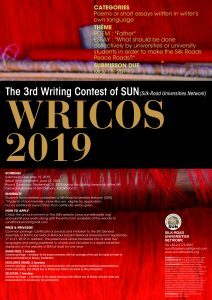 The theme of the poem of WRICOS 2019 is “ Father ” , and the theme of the essay is “ What should be done collectively by universities or university students in order to make the silk Roads Peace Roads? ” Students from members of SUN (The Silk-road Universities Network) can apply. Non members of universities of SUN are also eligible for application, but no additional other than certificates will be given. The application deadline is May 15, 2019. The recipient of the Grand Prize will be invited to the award ceremony which will be held on September 20, 2019 during the closing ceremony of the 5th General assembly of SUN (Almaty, Kazakhstan) with full coverage of the cost for air ticket (round trip), and accommodations (hotel and meals) at Almaty, Kazakhstan. For more information please visit to the website www.sun-silkroadia.org.